Nick graduated from University College London (UCL) with a B.Sc. in Molecular Cell Biology, and King’s College London with a Ph.D. in Nephrology / Cell Biology. Keen to work in the Duffield lab, he then set out to obtain research funding and was selected for a Fulbright Scholarship, sponsored by Diabetes UK. His research interests include: the signaling pathways of G-proteins, particularly Rho; mechanisms of cellular migration; the etiology and pathological activity of myofibroblasts; the pathogenesis of diabetic nephropathy and renal interstitial fibrosis. 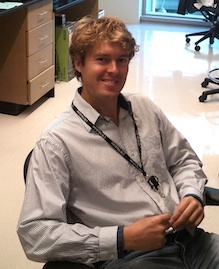 Nick has come to the Duffield lab with the central hypothesis that Rho activation is a critical step in the detachment of pericytes from the microvasculature, with resultant capillary rarefaction, and the subsequent transition of pericytes to myofibroblasts. By delineating and preventing these events, it is hoped that mortality and morbidity rates can be reduced in a wide range of chronic diseases, including diabetic nephropathy. When not working, Nick likes making music (rock and folk), playing racquet sports, and traveling to strange and wonderful new places.